As the cool nights of autumn set in, we gardeners are reminded that the main growing season is drawing to a close. However, passionate plantsmen know that the garden is not coming an end. A well-planned garden should be filled with vibrant fall colours, textures and fresh new fall flowers, too. One of my many favourite autumn-blooming perennials belongs to the genus Tricyrtis. 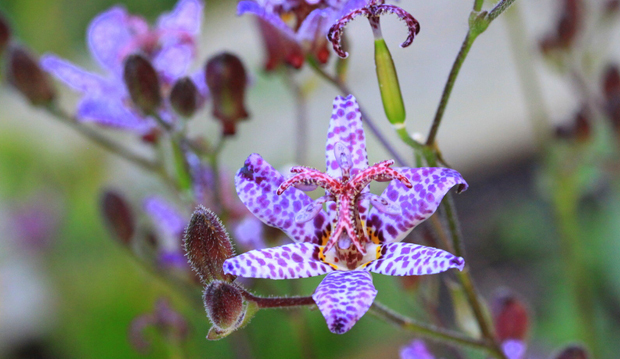 Commonly called toad lilies (an odd name for such a beautiful plant), these are a must for the late season. Their precious, orchid-like blossoms begin to appear on arching stems in late summer and continue into very late fall, often so late that new blooms and buds are damaged by frost. The small spotted flowers are a favourite of bees, and should be planted where they can be appreciated up close. Tricyrtis also make great cut flowers. Tricyrtis formosana ‘Dark Night’ (shown above) is hardy to Zone 4, and in the TBG gardens grows to a height of two to three feet (and depending on where planted, even taller). Although they are often recommended as shade plants, I find they perform best with some early or late afternoon sunshine. Tricyrtis prefer an average-to-moist garden soil with a good supply of organic matter. There are a number of different selections available at garden centres, including toad lilies with variegated or streaked foliage. Tricyrtis ‘Lightning Strike’ is another favourite of mine. Tricyrtis formosana ‘Dark Beauty’ can be found in full bloom in the pollinator garden and also beneath the paperbark maples, Acer griseum (another treasured pant with multiple seasons of interest) in the entry garden.